Abby, a five-year-old chestnut thoroughbred mare, is known for being accident prone and a “professional patient” as described by her owner Christy Abernathy. When Abby had a knee injury gone wrong coupled with suspicious nasal drainage, Abernathy thought it was something Abby could handle. 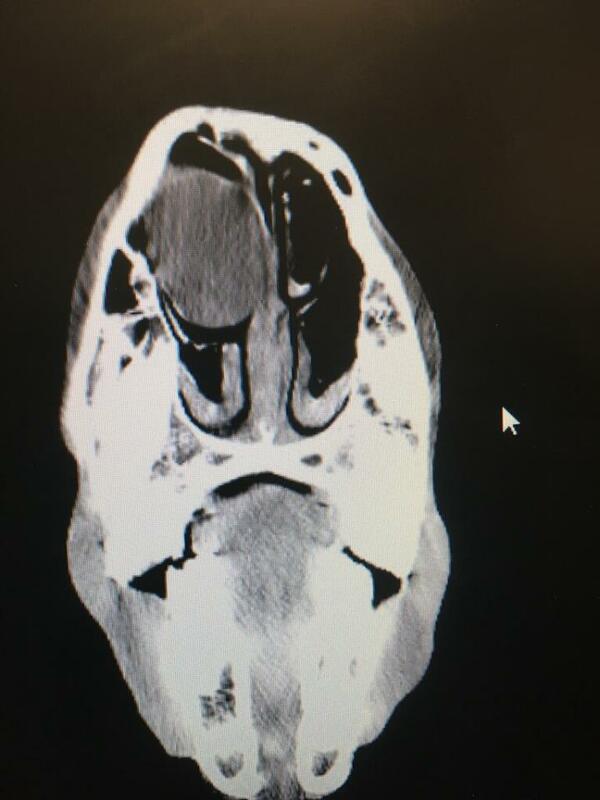 However, Auburn University College of Veterinary Medicine radiologists, using the standing CT machine, discovered a large cyst in Abby’s sinus cavity that would have compromised her health if left untreated. 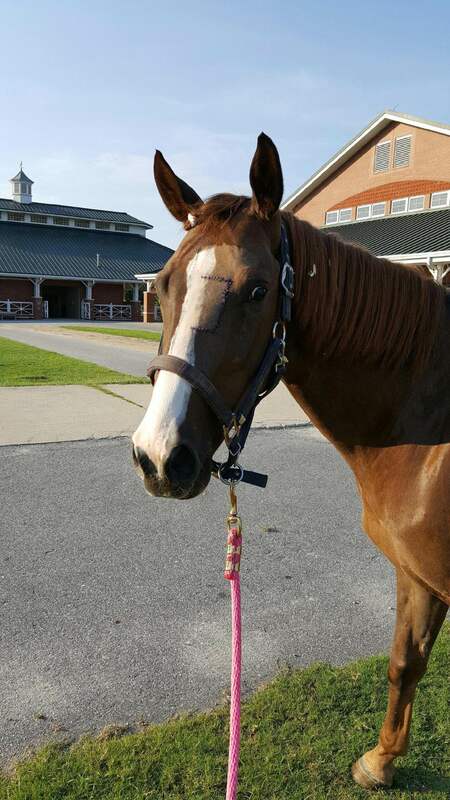 The mare is on her way to a full recovery, thanks to the efforts of Equine faculty and staff. Abby has had a history of accidental injuries since Abernathy acquired her in 2012 as an underweight yearling with a serious leg injury. These minor setbacks have not affected her youthful, sassy character. One day, Abby returned to her stall from grazing with a large gash and puncture on her front left leg above her knee. Since injuries were routine, Abernathy treated Abby as usual by wrapping her knee. Tissue started to fill in and heal, but Abernathy later found Abby’s knee had become extremely swollen. The standing CT machine found a large cyst in Abby’s nasal cavity, which can be seen in the upper left section of Abby’s X-ray. The tissue in her leg eventually became necrotic, but after specialized care by Dr. Kaylin Touche, her attending veterinarian, Abby made a quick turnaround and healthy granulation tissue began to replace it. The Abernathy family thought that Abby was on her way to finally recovering. Weeks later, however, worsening symptoms in Abby’s knee reappeared and Dr. Touche came by the Abernathy’s property in Ball Ground, Ga. to inspect it. Even though the Abernathy’s and Dr. Touche provided excellent care, Abby soon became lame. Dr. Touche returned and suspected a bone infection and recommended a trip to the College of Veterinary Medicine’s J.T. Vaughan Large Animal Teaching Hospital. Dr. Reid Hanson, professor of Equine Sports Medicine and Surgery in the Department of Clinical Sciences, developed a game plan with Abernathy to carefully treat Abby’s knee. The treatment was successful and there was no more infection of the knee (carpus), but Abernathy requested a standing CT for Abby for good measure since she had a periodic drainage from her sinus and was not her natural rambunctious self. Auburn is one of few veterinary facilities in the country with this latest technology. The good measure turned out to be Abby’s saving grace. The standing CT results showed a large cyst in her left sinus, previously difficult to see. Abernathy moved forward with surgery to have the cyst removed. Since her surgery, Abby is on her way to full recovery with a lot of rest and down time. “We are so fortunate to have this quality of care so close by, but especially the standing CT machine. It was a game-changer for my horse,” Abernathy said. For more information about the JT Vaughn Large Animal Teaching Hospital, visit https://www.vetmed.auburn.edu/animal-owners/jt-vaughan-large-animal-teaching-hospital/.